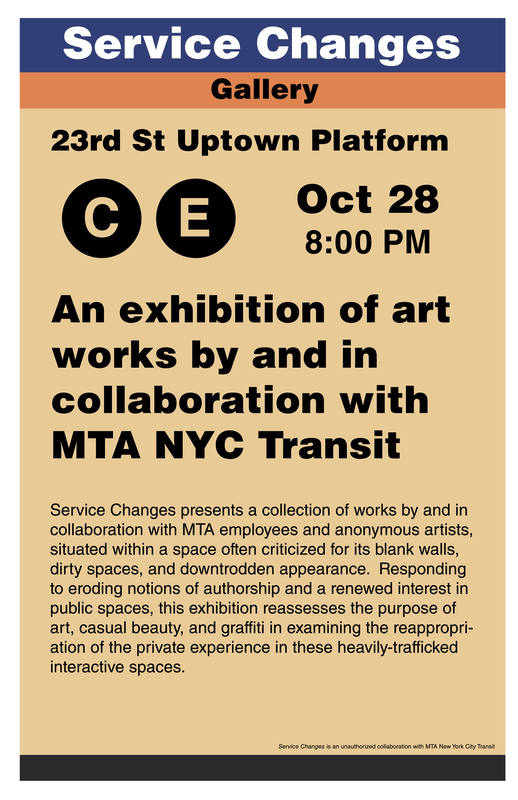 In the fall of 2008, Service Changes Gallery celebrated the opening of a new unauthorized exhibition on the C/E 23rd St. Uptown subway platform in New York City. 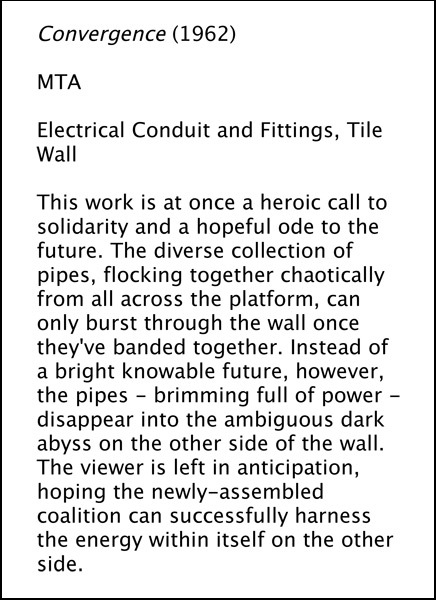 Curated by Jen Small, Jason Eppink, and Charlie Todd in association with Improv Everywhere, the exhibition—still on view—presents a collection of works by and in collaboration with MTA employees, contractors, and anonymous artists. Development of this visionary exhibition began in 1932, taking a full 76 years to come to its current form, though the exhibition presents only a fleeting snapshot of the continuing evolution of this important incubator of creativity. 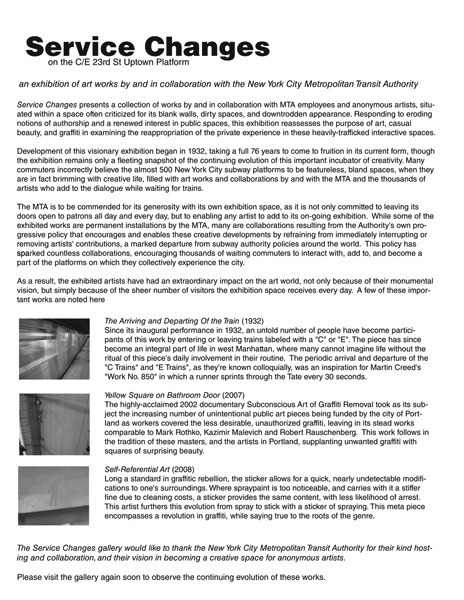 While some of the exhibited works are permanent installations by the MTA, many are collaborations resulting from the Authority’s own progressive policy that encourages and enables these creative developments by refraining from immediately interrupting or removing artists’ contributions, a marked departure from subway authority policies around the world. This policy has sparked countless collaborations, encouraging thousands of waiting commuters to interact with, add to, and become a part of the platforms on which they collectively experience the city. As a result, the exhibited artists have had an extraordinary impact on the art world, not only because of their monumental vision, but simply because of the sheer number of visitors the exhibition space receives every day. The Service Changes Gallery remains on display twenty-four hours a day, seven days a week, steadily evolving as works are rotated in and out of view. Visit Improv Everywhere to learn more about the recent gallery opening party. 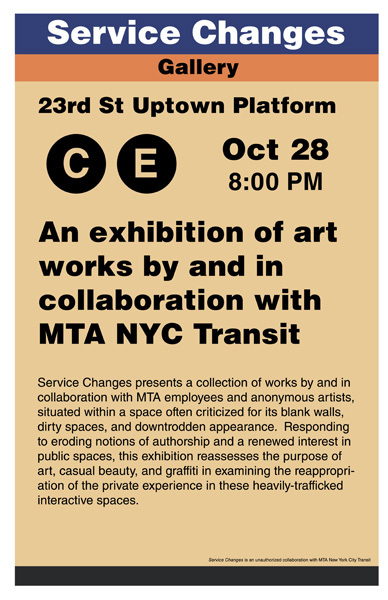 Carefully reconstructed from the MTA's own announcement flyers. An introduction to the venue and the works on display. Twenty-eight placards explain the finer meaning of the important artworks on display. Many artists, pranksters, and curators have experimented with wall text, exhibitions in unexpected locations, and art as a (re)framing device. Here are just a few works that inspired or are related to the Service Changes gallery opening.